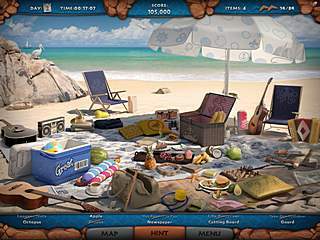 Vacation Quest: Australia is a hidden object game where you get to enjoy the searches for the items listed and play a few puzzles. So if you are looking for a creepy and dark game with a mysterious and complicated story, then keep looking. This one is not for you. 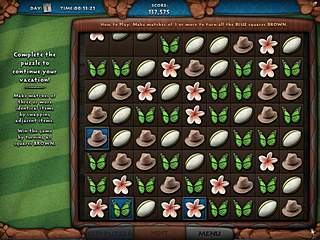 You can say that the game is a streightforward HOG with some not-so-inventive puzzles. The story of Vacation Quest: Australia boils down to the simple fact that you travel all the way to Australia and explore lots of different locations. The game is kind of relaxed and positive with many beautiful graphics. The scenes are so clear and sharp, bright and beautiful that it almost feels like it is a picture of a real place. Even though the game's short description includes words like "adventure", and the title itself promises you a quest, there is actually no adventure as the modern players would understand it. There is no going back and forth trying to find and then to use all the inventory. The puzzles are all the classic ones, like jigsaw or match-three. They are not extremely challenging as well as the hidden object searches. But it always depends on the player's experience. You can say that the game is a streightforward HOG with some not-so-inventive puzzles. There are boomerangs in all the locations. It you collect all of them, your trip becomes longer as you get extra levels. Plus you get to learn some of the local language as you play through all the stages. One other enjoyable part of the game was a jigsaw round, that offers a new way of solving the puzzle. Even though the game is like a leap back in the past of hidden object games, it is still good for a relaxed search for items in beautiful locations, which is sometimes what you want. A aauctlly great submit by you my friend. We have bookmarked this page and will appear back following several days to examine for any new posts that you simply make. Cynthia1)I simply do not bieelve that a truly altruistic person exists because everyone ultimately decides to do something defined as virtuous for their own gain. You may argue that, for example, helping an old lady cross the street cannot possibly be an act of selfishness. However, by having her praise your kindness and goodness , it will increase the level of satisfaction you have with yourself as a person and give you something to feel good about for the rest of the day. Unconsciously, perhaps, but you do not help the old lady purely out of concern for her safety but rather for your own self respect. If you were to know that she would yell at you for harassing her instead of praising you, you would not offer to help in the first place.2)The act of doing good is what benefits society and keeps it improving so the reason behind the act should not matter. Many people have the best of intentions and reasons to do something positive for others but never get around to it. These individuals won't ever be appreciated. Even if your reason is punishment for doing something bad such as criminals sentenced to volunteer work, it still helps the community in a positive way. This is Vacation Quest: Australia review. Download this game here.